For this section, I enlisted the help of friends, followers, and fellow recovery warriors to help outline the best and worst things to say to someone with an eating disorder. Let’s face it, it’s a tricky thing, being close to someone with a mental illness. Sometimes the right thing say today can be the wrong thing to say tomorrow. It’s not your fault, and it isn’t your loved one’s fault either. Try to keep in mind that you’re both fighting against the monster living inside your loved one’s head. Acknowledge that they have an eating disorder, and remind your loved one that it isn’t their fault. During my battle with an eating disorder, I went back and forth between believing that I had a problem, and thinking that I wasn’t ______ enough to have an eating disorder, that I was just being selfish, or silly, or whatever. If you can be there to remind them during this time that they DO have a problem, and they didn’t choose to get sick, it will go a long way towards helping them believe that they are worthy of help. Remind them that it IS in their power to keep choosing recovery. Another good “do do” answer I got is to check in, from time to time. In a private (ie. NOT public), discreet location, ask them how they are, and if there’s anything you can do. They may snap back with an “I’m FINE”, but most of the time it will mean a lot that you asked. The “don’t do” answers all seemed to centre around a theme: Don’t focus on the weight! Each of these statements is different from the last, but each can be equally harmful. a) You never know the circumstances of someone’s weight loss, and even if it seems healthy to you, it may make it hard for the person to accept weight gain as a part of recovery. b) You may be trying to soften the blow, but it sends mixed messages. c) Really, the core issues behind an eating disorder have nothing to do with weight, it’s just how the core issues manifested. An eating disorder is not a diet, it’s a mental illness. d) Not everyone with an eating disorder is emaciated. 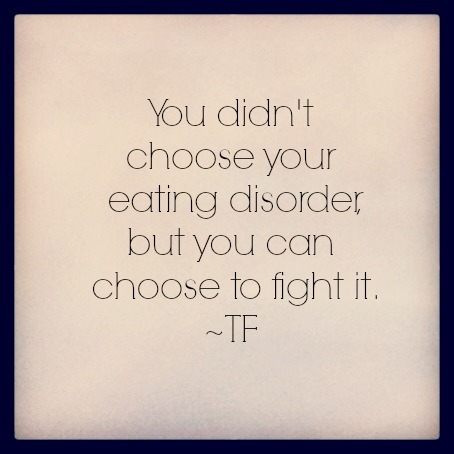 Anorexia is only one subtype of eating disorders. People with eating disorders can be underweight, at a normal weight, overweight, or obese. You never know. e) When someone with an eating disorder has gained weight, chances are they aren’t going to be too happy about it. Weight has to be restored for the brain to function properly, so most of the hard work takes place during or after weight gain. Your loved one is going to be hyper-aware of his or her climbing weight, and having you focus on it, too, may be too much to bear. Along those same lines, NEVER ASK SOMEONE WITH AN EATING DISORDER FOR DIET TIPS!!! I repeat: an eating disorder is not a diet. The things they are doing to lose weight are not healthy, and by idealizing symptoms of their illness, you’re basically saying that what they’re doing is okay. Never say, “Boy, I wish I had your willpower!” Starving, over-exercising, etc. are not signs of willpower, they are signs of a mental illness. It’s like saying to a cancer patient “Boy, I wish all my hair fell out; I hate shaving my legs!” You’re trivializing their life-or-death illness. Don’t try and “fix” your loved one. This is a challenging one. You care so much, and just want your loved one to be well and happy. Unfortunately, you can’t police them at every moment: this will only drive your loved one further from you and deeper into their illness. When they are upset, don’t try to solve their problem, just listen. Chances are, they just need to talk. Advice from professionals (therapist, nutritionist, psychiatrist) may not seem logical to you, but try not to question it. Your loved one DESPERATELY needs to trust the people in charge of his or her care, and casting doubt can be damaging. Forgive yourself if you do or say something wrong. There is no way of knowing everything that will negatively affect your loved one. Do your best, but remember that you’re human. Above all, remember that there is always hope. Never lose sight of it. Do you have a “do” or a “don’t” to add? Feel free to comment below, or message me privately. I’ve nominated you for the shine on award ! Please find the details on my blog 🙂 http://bendymemoirs.wordpress.com/ I just thought your blog was meaningful, helpful, and encouraging. Thank you.